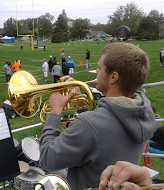 ￼Rocky senior Koree MacMurdie plays his horn during one of Rocky’s home football games. The quarterback throws a long pass to the wide receiver, who dives into the end zone catching the ball. Touchdown: Rocky! The crowd cheers and, as always, the pep band strikes up the school song. What would happen to the atmosphere of the game if the band were removed? In 2013 the Rocky pep band moved from the stands to the north end zone of the football field. The band wanted to see if it would be a better position from which to play during the game, but they quickly realized that changing their location removed a crucial element from the game. Tony Hammond, director of bands at Rocky Mountain College, said, “In the end we know we need to be in the stands,” adding that moving the band showed, “…how ingrained the band is in the whole show of a football Saturday.” After seeing the effect of the location of the band last year, the Rocky pep band is back in the stands to help cheer on the Battlin’ Bears. The presence of the band is not only noticeable, but very much appreciated by the athletes, coaches, and fans alike, according to Hammond. He said that the fans often show their appreciation by both telling the band how much they enjoy the performance and by expressing that the band is really missed when, for whatever reason, it cannot be there. The use of music to encourage victory goes back centuries. Bands were used to march troops across great distances and cheer them on as they fought for their lives. As marching became an ineffective way of moving soldiers, the idea of marching bands moved to the collegiate world. A tradition began in which bands perform while various sports teams work toward their big wins. For all support the fans offer, there is one more gesture that Hammond says “would go further to than anything to show the band how much they are appreciated”: to stand and clap along anytime that the “Rocky Mountain March” (Rocky’s fight song) is played. Hammond said, “That is one major thing missing in the college sports atmosphere at Rocky Mountain College,” adding that it could be changed in one game.